The president got what you might call a grassroots display of support at the White House, welcoming an 11-year-old Virginia boy who offered to help cut the lawn. President Donald Trump high-fived Frank Giaccio, who lives in the Washington suburb of Falls Church. The White House says Frank wrote Trump to say he admires the president's business acumen and runs his own neighborhood lawn-care business. 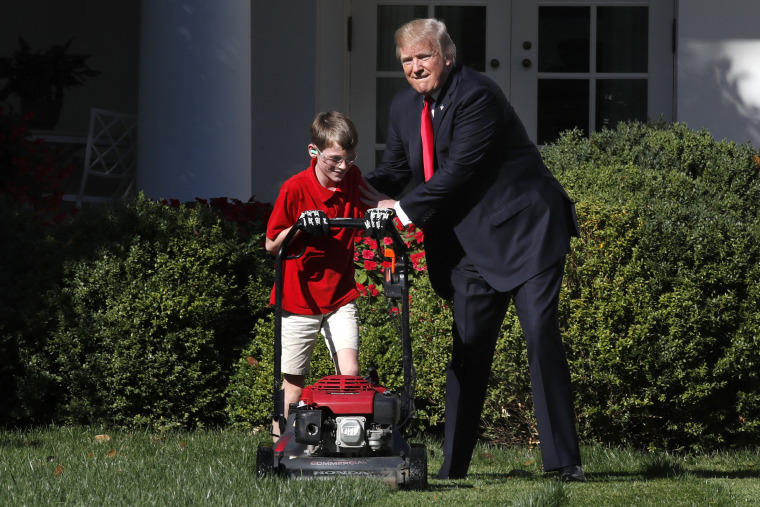 Frank was so focused on pushing the lawn mower, he didn't notice Trump had emerged to greet him until the president was next to him in the Rose Garden. Trump says Frank is "the future of the country" and will soon be "very famous." Frank said he wants to be a Navy SEAL, to which Trump exclaimed, "He'll make it."